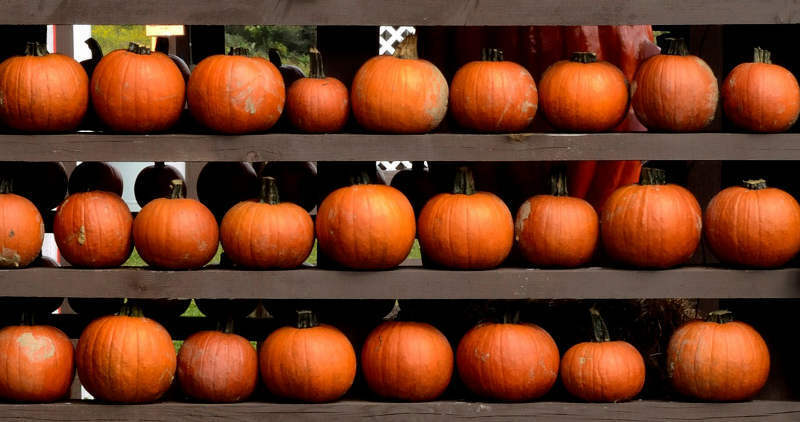 If you have plenty of space in your vegetable garden, then it’s worthwhile growing some pumpkins and marrows. Both store well, and both have multiple uses in the kitchen, not just as cooked vegetables, but in soups and chutneys. Of course a marrow is simply a zucchini or courgette that is allowed to keep growing. The other advantages of these two vegetables is that they are very low maintenance, although you may need to intervene to assist pollination if you don’t have many bees in your garden. There are no special soil requirements for either of these vegetables, and they do equally as well from seed or seedlings. My preference is to use seed direct to where I want them to grow. I usually add a little liquid fertiliser when the seedlings appear. The best time to sow is late winter/early spring when growth is likely to be most vigorous. However, you can start them off right through the summer months, and even into our mild Autumn. The key to a good crop is to make sure that the male flowers cross pollinate with the female flowers, (If you can’t tell the difference between the male and female flower then I’m afraid you have led a very sheltered life). 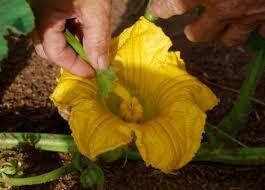 The best time to cross pollinate is first thing in the morning when the flowers are completely open. Simply pick the stamen from the male flower and rub the pollen all over the stamen of the female flower. Or use an eyebrow brush to transfer the pollen. 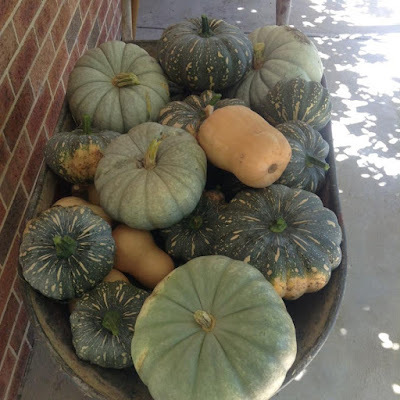 Harvest your marrows at any-time once they get past the zucchini stage. Pumpkins should only be harvested when the umbilical stalk has dried right off, and the pumpkin returns a hollow sound when you tap it with your knuckle. Both pumpkins and marrows will keep uncut for many weeks if stored in a cool, dry environment. One word of caution. Be aware that our friendly Coffs Harbour snakes quite like hanging out in pumpkin patches where they can hide underneath the large pumpkin leaves. If you are a bit nervous about this at harvest time, then send someone you don’t like out to do the picking!